Dr. Beáta Csathó of the State University of New York (SUNY), Buffalo has been studying the Greenland Ice Sheet for a number of years and is currently involved in a number of projects funded by NASA and NSF. At the moment she's studying the mass balance of the Greenland Ice Sheet using ICES at satellite laser altimetry with Tony Schenk of Ohio State University and the reconstruction of historical outlet glacier changes as part of the project "IPY: POLENET/Greenland:Using Bedrock Geodesy to Constrain Past and Present Day Changes in Greenland's Ice Mass" with Michael Bevis, also of Ohio State University. Along with her colleague at SUNY Buffalo, Jason Briner, Dr.Csathó is also a co-Principal Investigator on a project entitled "The Sensitivity of the Greenland Ice Sheet to Climate Change: Reconstructing the response of the Jakobshavn Isbrae during the Little Ice Age and Holocene Thermal Maximum." In this interview, Dr. Csathó discusses what we know as far as current projections of the ice sheet are concerned and some ways in which models of the Greenland Ice Sheet's behaviour are being improved. What is the general future outlook for the Greenland Ice Sheet? It's difficult to make exact predictions. What we do know at this point is that according to some estimates the melting of the Greenland Ice Sheet is currently contributing about 0.5 mm a year to sea levels, which is about 15-20% of total current sea level rise. Current estimates of ice mass loss from the Greenland Ice Sheet are between 150-300 gigatons per year. To put this in perspective, this rate of loss is at least twice or even three times as much as it was at the beginning of the 1990s, which means mass loss on the Greenland Ice Sheet has really been increasing in the past 15 years or so. A big part of this loss is coming from the outlet glaciers, which are thinning and calving into the ocean at a faster rate. Something we still don't know is what will happen when the outlet glaciers retreat further inland - whether they will eventually reach a stable position that slows down mass loss (the ice sheet is more sensitive where the bedrock is below sea level; it can reach a more stable position once the ice has retreated to where it rests on bedrock lying above sea level). But overall, I think everybody agrees that as temperature increases, mass loss will continue because surface melting will increase ablation. As for future mass loss, I wouldn't dare to make a projection. There are just too many variables that haven't been examined at this point to be able to make an accurate projection at this point. In the latest IPCC report, they didn't factor ice sheet dynamics into current sea level rise projections. If we start with known past conditions, we don't arrive at current conditions from these models. So the goal for the next IPCC assessment report will be to improve ice sheet models by coupling ice sheet, atmosphere, and ocean models so they can be used for predicting future scenarios. Hopefully they will be able to give us a better idea of what will happen. Is it possible to make at least some short-term predictions? NASA and other investigators use a number of approaches, often in combination, including satellite laser and radar altimetry, InSAR etc. Right now our research group is working on deriving improved estimates of mass loss from ICESat satellite laser altimetery data. Sometime within the next couple of months we'll have refined time series from 2003-present, and from this we'll be able to see some trends and spatial distribution of changes as they evolve in time. How good are the current models on the Greenland Ice Sheet? Do you have coupled models that incorporate the ocean and the atmosphere? The majority of the current numerical models out there are only iced ynamics and ice flow models. There are some new ones that are coupled atmosphere-ice models. For example the next version of theCommunity Climate System Model (CCSM), which is an IPCC-class coupled climate model developed by a large community of scientists from universities and national labs, will include a dynamic ice sheet model for the first time. I don't think there are currently any models that include the ocean - at least ones that cover the entire ice sheet. An evolving modelling initiative in the US is SeaRISE (Sea-level Response to Ice Sheet Evolution), led by Bob Bindschadler from NASA.The goal of SeaRISE is not to come up with one projection, but a rangeofprojections by using different models. There are maybe ten groups working in parallel using the same comprehensive data for all of Greenland and Antarctica. The first meeting of this group will take place this June. To what extent do atmospheric and ocean warming play in the acceleration of the melting of the ice sheet? There are two components at play. The first is increased ablation, which is caused by atmospheric warming. This means you get more melt on the surface that's running off and going through crevasses in the ice to the bedrock before flowing to the sea due to atmospheric warming. The other component is ice dynamics. Outlet glaciers are speeding up, calving is increasing, bottom melt (which takes place under floating ice tongues of outlet glaciers and under ice shelves) is increasing, and there is more and more evidence that this is due to ocean warming. There was a recent paper on the Jakobshavn Glacier by Dave Holland et al., in which he used ocean temperature measurements taken for the commercial fishing industry to show that the thinning of the glacier was very much coincident with the increase in ocean temperatures. There was another recent paper by Faezeh Nick et al. suggesting that changes at the terminus of outlet glaciers might have a much larger effect outlet glacier dynamics than increased basal lubrication through surface melt reaching the glacier bed. If you only have surface melt happening, you cannot account for a big fluctuation and increase in speed of glacier discharge without taking ocean warming into account. So in summary, I would say that both atmospheric and ocean warming play a role, although we don't know the exact ratio between the two at the moment. However the role of the atmosphere and the ocean in the thinning of glaciers is probably the most actively researched topic currently in glaciology, not only in Greenland but also in Antarctica. To what extent do we understand how moulins and glacial lakes affect or accelerate mass loss from the Greenland Ice Sheet? In Greenland, surface melt water could rapidly drain through the ice sheet into the subglacial hydrologic system causing localized short-lived accelerations as well as seasonal increase of ice velocity on outlet glaciers and surrounding slow moving regions. For example seasonal speedup due to increased bedrock lubrication could reach 50-100 % in west Greenland. There are subglacial lakes in Antarctica, and they definitely have an effect on the dynamics of the Antarctic Ice Sheet. The ice sheet down there is big enough and the geometry of it is such that glacial lakes such as Lake Vostok can form. Recent evidence shows that subglacial water can fluctuate and can move rapidly periodically between active reservoirs during subglacial floods, and as the volume of water in these lakes change, it has a big effect on glacier velocity and potentially on ice loss as well. The Greenland Ice Sheet on the other hand is too small and the geometry of it is such that subglacial lakes don't form. Moulins that drain surface water from the ice sheet create a small increase in surface velocity, but it doesn't appear to be drastic, so any water that goes through the ice will immediately drain towards the edge of the ice. What about meltwater ponds on the surface of the ice sheet? The only thing they do is decrease the albedo of the surface of the ice sheet, creating a positive feedback and increasing the melting rate. While they do contribute to the increase in mass loss, they don't have any effect on the velocity of the ice flow unless they drain down to the bedrock via moulins. An Associate Professor at the State University of New York (SUNY) at Buffalo, Beáta Csathó's research interests lie in monitoring ice sheet mass balance and ice dynamics in order to understand ongoing rapid changes in the cryosphere. Her research combines geophysical, remote sensing, climate and glaciological observations to understand the linkages between subglacial geology and ice sheet dynamics. 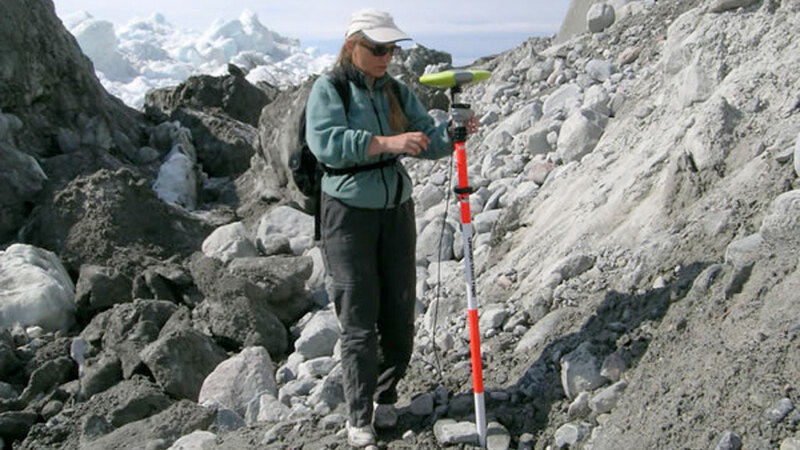 She also reconstructs cryospheric changes from historical observations and develops new methods for change detection, data fusion and visualization to support Earth science applications.